Are you ready to get the old gang back together for one last, spectacular pop star experience? You were never quite seen as the leader of the group, but the real fans all saw you as a sort of captain of the team. You were always fit, and ready to burst out onto the stage with a flip or cart wheel to really get the crowd going. How you hold onto that mic the whole time we'll never know, but it must be based on that awesome sporty power you've got going on. Maintaining a ponytail that's almost half as long as you are tall can be a bit of a struggle though, even for you. Have you ever tried staying in shape and doing squats at the gym while the bar is pulling down on your hair? It's a little distracting, and uncomfortable! 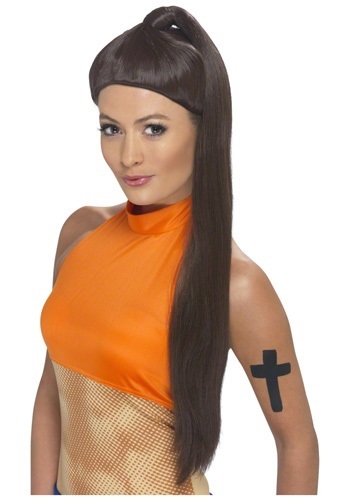 How about you keep this wig around for the big shows and rock that shorter style while you work on your fitness.